I don’t usually do a foreign trip based around finding a single species, but that is what happened during the first nine days of February. In March last year Magnus Robb and Rene Pop of the Sound Approach made a startling discovery, whilst attempting to record Pallid Scops Owl, a new species to science, the Omani Owl, was found in the Al Hajar mountains of northern Oman. The paper in the link below was published on 5th October 2013. The Omani Owl. Photograph by Arnoud van den Berg/the Sound Approach. Partly because it was the first new non-cyptic bird species for science to be discovered in Western Palearctic (Shirihai and Svensson boundaries) for forty years and partly because I knew all the people involved in the discovery, I was very interested in seeing the owl. Discussions with Mike Watson of Birdquest led to the setting up of the Omani Owl Expedition for the first week of February, a time which was expected (but failed to be) peak time for vocalisations. In the event four of us booked on the tour and here is the story of the trip…..
Day One. On our first afternoon we visited the beach at Ras As Sawadi. The main attraction being the large number of wintering gulls and terns. Most are Heuglin’s Gulls, a race of Lesser Black-backed from arctic Siberia, but include Slender-billed, Steppe, Caspian and the dark-headed Pallas’ Gulls from central and western Asia and the local Sooty Gulls. Unfortunately as it was the weekend many of the locals were racing 4x4s and off road buggies up and down the beach making the critical examination of the gulls difficult. The large gull in the centre and the one at bottom left are Pallas’, the rest are Heuglin’s Gulls and Slender-billed. The bane of any gull watcher! More or less confined to the Arabian Peninsula, Sooty Gull were easy to identify and quite common. Of all the taxa of ‘large white-headed gulls’ one of the least known is ‘barabensis’ or Steppe Gull. Variously considered a subspecies of Lesser Black-backed or Caspian Gull or even a species in its own right, this individual had the correct wing tip pattern but had a pale, not dark eye, something that apparently occurs in those ‘barabensis’ that winter in the Arabian Gulf. We were appalled to see about 20 decapitated sharks on one part of the beach. Worldwide over 100 million sharks are killed annually, mainly for shark fin soup. Clearly this is having a huge effect on the ecology of the oceans. Early on day two we headed north to the Sohar Sun Farms. This agricultural area has irrigated fields, piles of slurry and sewage ponds, all highly attractive to birds in a desert environment. Unfortunately the farm is closing and even as we birded around the cow sheds we saw cattle being removed in trucks. However we saw lots of good birds, it was easily the birdiest site of the trip. Vociferous Red-wattled Lapwings were common and conspicuous. … but pride of place went to a group of 14 Sociable Lapwings on the irrigated fields.fields. This Central Asian species has declined precipitously in recent years and is considered to be critically endangered …. … and several beautiful White-tailed Lapwings completed the trio of lapwing species. Three Oriental Skylarks was a good find. Raptors included Bonelli’s, Steppe, Greater Spotted and Imperial (in photo above) Eagles. Pretty Indian Rollers were seen all along the coastal strip. We returned for a late lunch and then headed out for our first owl sortie. We traveled to the wadi where the Omani Owl was first discovered and as dusk fell, searched at the ‘type locality’. Once the New Moon had set it became very dark indeed. We stayed at the site from 1730 – 0030 seeing several little Pallid Scops Owls but no Omani Owls, although one was possibly heard to call once. On day three we spent the morning at a farm close to the hotel. It wasn’t as good as the Sohar farm for birds but we did see several Desert Wheatears and in the nearby scrub, an Asian Desert Warbler. We also made a repeat visit to the beach at Ras Al Sawadi but the tide was very high and most gulls were too distant. The pale-eyed Asian Desert Warbler is a scarce visitor from Central Asia. This Isabelline Wheatear shows the diagnostic tail pattern. Adult male Desert Wheatears are unmistakable but the all black tail is diagnostic in all plumages. The beautiful Green Bee-eater perched an the wire fences. Due to it’s generally scruffy appearance it has been suggested that this bird would be better named the Disgraceful Prinia! We returned to the owl wadi in the afternoon to allow us to have a good look around before it got dark. After dusk we joined up with another birder, John McLoughlin (aka Johnny Mac) who had contacted Mike in advance, we searched similar areas to the previous night, seeing more Pallid Scops Owls and hearing a definite contact note from the Omani Owl at the ‘type locality’, but no amount of searching with the spotlight would reveal the bird. We began to realise why this bird had remained undiscovered for so long! At one stage we saw someone else spotlighting from the rough track that ran along the bottom of the wadi, some 200m or so from the road. We realised they were locals and when a spotlight was shone on them they spun the vehicle round and zoomed off, firing a shot in the air as they went. Clearly the presence of local hunters in the area wasn’t desirable whilst we were owling. Around about 2145 we stopped at a pull-in near the start of the wadi to eat a snack. As soon as we got tucking-in we heard an owl call. A number of different calls were heard, one low and gruff, another like the ‘kwick’ of a young Tawny Owl and a few shrill notes that sounded rather familiar. The distant rock face was spotlighted and an owl found. Chaos, of course ensued, as we all tried to get views through the scope, pass the torch around so the torch holder could have a look as well and try and record the vocalisations, all this in a lay-by littered with discarded wood and plastic which had us tripping over in the dark. Although 300m or more away, the circular facial disk and dark streaked plumage could be seen in the powerful beam before it flew off into the inky blackness. We were elated, views were distant, but we were sure we had the owl ‘under the belt’. It was decided that if left now we could have a celebratory pint or two in the bar! The morning of day four saw us return to the owl wadi. We found a rough track that led much closer to where the owl had been the night before – but then made an unwelcome discovery – Little Owls, or to be more precise Lilith Owls, a potential split from Little Owl named after the Babylonian queen of the night. We were downcast, had we screwed up, was the bird we saw last night in the torch beam merely Anthene (noctua) lilith? Back at the hotel we listened to the recording from last night, on reflection they were similar to Little Owl (differences would be expected if lilith was a separate species from Little Owl) but the strange gruff call hadn’t been recorded. I was adamant that what I saw in the scope wasn’t a Little Owl, was completely the wrong shape – both species must have been present. We contacted Magnus who suggested that the arrival of an Omani Owl may have caused the Little/Lilith’s to start calling; quite possible, but still an air of uncertainty hung over our sighting. Other birds in the area included this smart Desert Lark …. We decided the best option was to come back later in the night after the traffic had stopped and stay out until the early hours. We rested in the afternoon and arrived at 2045 and stayed until 0330. We didn’t get a squeak from Pallid Scops, Lilith or Omani Owls, the highlight perhaps being some very vocal Red Fox’s, their blood curdling cries echoing around the wadi. At around 0230 I suggested Mike should play the lilith calls from last night at the same locality and then spotlight them. This worked. One responded immediately and when spotlighted it was obvious that it wasn’t the bird from the night before, appearing as just a tiny round ball on the cliff face. We felt better; yesterdays views weren’t much but at least they must have been of the real ‘McCoy’. Day five Hardly surprisingly, as we didn’t get to bed until 0430, we weren’t up early. A very late breakfast was enlivened by views of a Crested Honey-buzzard outside the restaurant. This species is a very rare, but regular winter visitor to the Middle East from Siberia, the bulk of the population wintering in SE Asia. I got good views but didn’t have my camera with me. Mike got some good shots and I’ll post some here later when I can get a copy. We spent the afternoon and evening in a completely different wadi some distance away. This extensive wadi system had many side valleys all with spectacular scenery. We were shown around these charming irrigated gardens by some welcoming locals. They looked full of promise but actually were devoid of birds. We did see a number of Red-tailed (or Persian) Wheatears, winter visitors from Iran. As the sun set we waited for darkness, but by 2300 we had seen or heard absolutely nothing. The only good thing we discovered was that some of the locals knew the Omani Owl vocalisations, but said they could only be heard much higher up. You could hide a thousand owls in this terrain! Day six saw us making a long drive up to the UAE border for two Omani specialties, the Arabian race of Collared Kingfisher and Varied Wheatear. Somewhat knackered after multiple late nights and irregular meals, we opted for breakfast before we left, which may have been a mistake as we dipped on the kingfisher but did, at least, see the wheatear. We found this Variable Wheatear just before we had to leave. The birds wintering habitat is being destroyed for yet more roads, something that Oman seems to have a surplus of. As the name suggest Variable Wheatears come in three different morphs (now ascribed to subspecies), this form is known as ‘picata’. Back at the hotel we had good news, whilst we were searching the big wadi last night, Johnny Mac had found a separate smaller wadi and had heard an Omani Owl give its quiet contact call at 1830 and 2100. It was obvious where we were going to go owling tonight. Again we waited patiently for dark but we had no success at all. However we returned pre-dawn on the seventh day and saw two Omani Owls perched and in flight. Views were too distant and too brief for photos but we now knew that there was a confirmed second locality for the species and we were the first two people see two together. We were delighted! Day seven. After our pre-dawn owling we returned to the hotel and packed up and drove the three hours to the Sayq Plateau on the south side of the Al Hajar mountains. We spent the afternoon and all of day eight birding in this extensive area. As well as the birds in the photos below, we saw a Ring Ousel (a major Omani rarity) and a flock of 18 Mistle Thrushes, there have only been four previous records (two singles and a pair). The Sayq Plateau consists of boulder strewn slopes covered with ancient twisted olive and juniper trees. Birds are few and far between but contain some real gems. A number of Rufous-tailed Rock Thrushes showed well. This wintering Pied Wheatear perched up in a village, hence the unusual background. It took a long slog across the stony plateau before we found this Streaked Scrub Warbler – right back where we started. This species is now placed in it’s own monotypic family and so is high on ‘family listers’ hit list. A number of picturesque village perched on the edge of deep chasms. This village was a holdout for a number of insurgents in the 1950’s and was bombed by the British at the request of the then Sultan. Day nine. We had intended to look for Omani Owls on the Sayq Plateau, but the nights were cold and windy and not conducive for listening for owls in the dark. After some debate we decided to return to ‘wadi Mac’ for one last try before we flew home. As a result we got up at 0130, checked out at 0200 and arrived at the wadi at 0500. At 0610 we found two Omani Owls perched high on the cliff and were able to watch them until it got light. One entered a small cave which could be a nest site, whilst the other perched some way away. We had to leave at 0630 to go the airport but somehow managed to stay until 0650. We did arrive in time for the flight and arrived home the same evening. OK, the views were poor, the birds were nearly a half kilometer away but between us and Johnny Mac, we had found a new site for the owls, were the first to observe a pair together, found a possible nest hole and been the first to see the species in daylight. The Sound Approach intend to follow up our sightings and hopefully soon, staked out Omani Owls will be on every Omani birding itinerary. 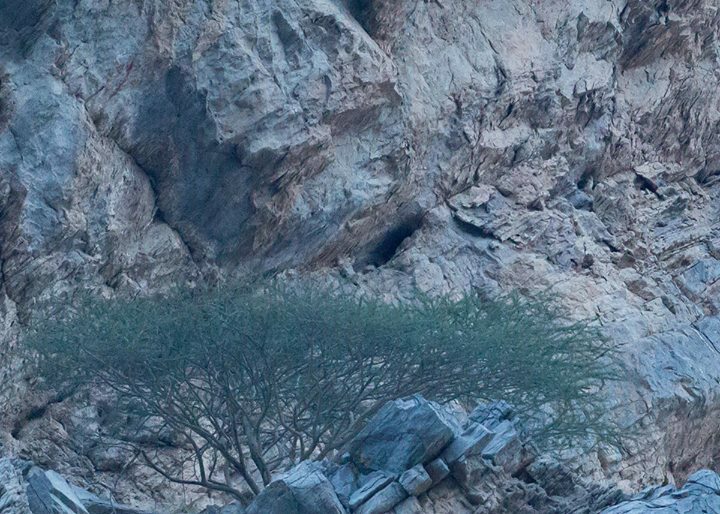 Omani Owl – can you spot it? It’s above the right hand corner of the tree. Photo by Mike Watson. « January 2014 – the wettest month since records began.